This more affordable 4K “SUHD” LED backlit offering from Samsung has some excellent picture features at a value price. Below we explain what makes a UHD TV an SUHD TV. For practical purposes the main difference is in the picture presentation. The SUHD JS7000 has more vibrant colors, light flow-through and perhaps slightly more artifacts and uniformity issues and lower contrast than the top UHD TVs such as the JU7100. It's a similar type of picture except side angle viewing is much better due to the IPS panel, while screen uniformity and blacks are not as strong. The Open Championship on the JS7000. Samsung still has the brightest LEDs back lights in the market. The powerful LEDs really give the JS7000 a step up in terms of light flow through the screen. 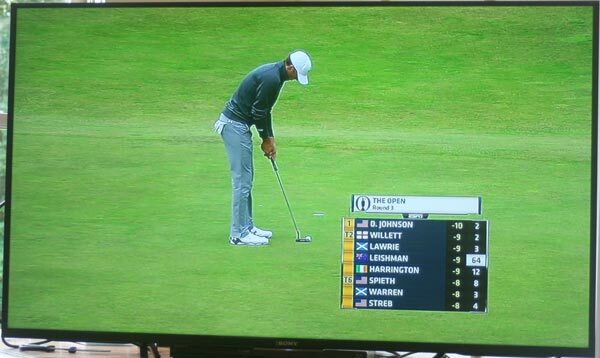 On-screen lighting images come through with pronounced pop when reviewing several sources such as The Fifth Element via Blu Ray, and The Open Championship via broadcast HD. Colors look natural and vibrant after calibration, even with the lower contrast. While this model does not compare to the top tier full array backlight options from Samsung or Sony, it's all you probably will need. Contrast and black levels are weaker in the JS7000 due to the use of an IPS panel in this model. This is a trade-off for much improved side angle viewing color saturation. Read more about that and color below in the Nano Crystal section. If you are a movie aficionado and watch mainly in dark rooms, this is probably not the TV for you. I would recommend the Sony XBRX850C or JU7100 Samsung instead. However, for sports daytime viewing, this model will suit you well. "4K up scaling of lower resolution signals is what really counts and the JS7000 excels"
Ever wonder if the picture quality is better on a 4K UHD TV with a standard definition or HD signal pumped into it? The answer is yes ONLY if the TV has a stellar upscaling and conversion technology built in. The JS7000 does an excellent job with 1080p signals and a very good job with 720p and lower end signals like 480p. I would place Samsung second behind only Sony in upscaling, but it also depends on which model of TV. This is one of the differences from the very top end TVs. For 2015 and 2016 Samsung has a new moniker for its 4K TVs. Why be plain when you can spice things up a bit? It's SUHD! And the “S” stands for Super. Alright, here are the particulars on what makes an SUHD. First, there is a new color system used called DCI P3 which has a wider color gamut or spectrum or pallet – call it what you will, it's a bigger range of colors - more Crayolas in the box. That color is dispersed and enhanced further by Nano Crystal Technology which is a competing technology to Quantum Dot technology used by some of the other OEMs. "The Auto Motion Plus dejudder feature is just as annoying as ever. Learn how to turn it off." The combination of the two does improve the color. It comes across more refined, cleaner and more defined than the previous 4K TVs. To me, it's a 10% improvement in color representation. In the JS7000 however, colors are slighly hurt by the lower contrast from the IPS panel. So it's an offset. Next, the SUHD lineup has a brighter backlight which is capable of hitting 1000 nits at peak brightness and produce deeper blacks (hopefully) as well, though this is more difficult to discern. In the JS7000 those LEDs are part of the reason this is an excellent daytime TV. Last, all SUHD TVs in Samsung's lineup have the proprietary Samsung developed Tizen operating system for Smart TV though that's not part of what differentiates an SUHD. SUHD is all about those upgraded picture quality features, especially the wider color gamut. "I would say the color production is 10%-15% better (due to the nano-crystal technology)"
Nano Crystal Technology is at the heart of improvements in color for SUHDs. All SUHD models by Samsung for 2015 and 2016 enjoy this new technology. This is Samsung's version of Quantum Dot technology. The Nano crystal layer (called the QDEF layer) is a stack of ultra thin film located between the LCDs (liquid crystals) or LEDs and the front protective glass or plexi layer. The benefits of the technology are a wider color gamut (more colors) produced by better disbursement through the Nano Crystal Diffuser Film. Think of the Nano Cystal layer as a color converter which assists the LCDs in creating more colors. Nano Crystal and Quantum Dot technology are thought of as competing technologies with OLEDs (organic light emitting diodes) which carry their own color to the surface of the panel. We were impressed with the color range and brightness provided by the Nano-Crystal layer. Finally, it works, I've seen the side by side demonstrations. It produces a cleaner, clearer and more defined color representation especially in the greens and yellows. But the more defining characteristic to me is that the colors from this panel are brighter. With a 4K UHD signal I would say the color production is 5% to 10% broader. Samsung, of course, puts the figure higher at 20% to 30%. The familiar Samsung Smart Hub makes a return on the JS7000 series. The JS7000 does not get the new Tizen OS Smart Hub of the top Samsung JS models, but instead gets a similar Smart Hub suite to last year with the same basic design. The system is somewhat slow loading compared to the Android system on the Sony and Sharp models, but the Apps selection is good. Samsung hit the mark with their user interface and intuitive navigation. It's easy to understand and navigate. The Smart Hub allows different users to have their own Apps and programming appear. This is a nice plus for a home with multiple TV users. HBO Go is a highlight in Apps choices. The Smart Hub for the JS7000 includes a full web browser. The included remote is a standard remote rather than the Smart remote on the other JS models and even the JU7100. Obviously, browsing and Smart TV options control is much slower through the 5-way controller. The JS7000 gets the quad-core rather than Octa Core Processor on the higher end JS models. As you might imagine from such a thin TV (with little housing for inbuilt speakers), the audio quality is not great. There are some enhancements that attempt to keep the speakers from sounding tinny and hollow, but a sound bar might be needed if you are sensitive to average quality TV audio. The brushed charcoal metal frame of around a half an an inch is simple and attractive. The accompanying V-shaped stand is also charcoal and is made of plastic. Looks are average. This TV does not come with the One Connect Mini box. There are a variety of future and current new standards for 4K inputs including: HDCP 2.2 (high bandwidth digital content protection i.e. copyright protection). MHL 3.0 (mobile high def link) compatibility. HDMI 2.0 allows larger bandwidth in 2160p@60fps (frames per second). HEVC and VP9 codecs are necessary to decode some currently and future 4K video sources from Netflix, Amazon, YouTube and others. The JS7000 is Direct TV Ready. All inputs go into the TV rather than an exterior box. All 4 HDMI ports are HDMI 2.0 and HDCP 2.2 compatible. The HDMI 3 port is MHL compatible. It's HEVC and VP9 decoder compatible. For $2099 the 60JS7000 is a good value choice for day time viewers of sports (think college football or major league baseball). It's interesting that Samsung produced this model in competition with their own JU7100, but it is a very different TV even though it does not get many of the features that the other JS models have. Competition is from the Sony X850C, Vizio M-series, and Samsung JU7100. Dimensions TV w/ stand: 53.7" x 33" x 12.8"
TV Only: 53.7" x 31.1" x 2.5"